Sunday afternoon at the Studio on the Square, the On Location Memphis Film and Music Festival screened a documentary called We Juke Up In Here, a sequel to an earlier documentary called M For Mississippi. The film was made by Roger Stolle, a blues historian and the owner of Clarksdale’s Cat Head Delta Blues store, and Jeff Konkel, the owner of the amazing Broke and Hungry Records label in St. Louis. Given the subject matter of the film, Mississippi delta blues and juke joints, I expected to like We Juke Up In Here already, but I hadn’t expected the production to be so beautiful, and there’s really no other way to describe it. The scenes of Mississippi wilderness during travel sequences are vivid, the interviews are frank and informative, and the music, both that played in the jukes and that of the soundtrack is truly incredible. Unfortunately, the ultimate theme of the film is the ways in which the Mississippi juke joints are dying out and fading, and so the movie focuses ultimately on one, the legendary Red’s Lounge in Clarksdale owned by Red Paden, a juke that simply has refused to die. So ultimately, We Juke is a bittersweet film, beautiful in its celebration of Mississippi’s African-American folklore, but with the ominous clouds of loss looming on the horizon. After the screening, Roger graciously took our questions and discussed some of the making of the film. The music showcases at this year’s On Location Memphis Film and Music Festival were held in downtown Memphis at Purple Haze. On Friday and Saturday nights, performers of all genres from around the country performed for conference attendees and film makers. After the luncheon at the Rendezvous, On Location Memphis filmmakers and attendees headed down to Studio on the Square in Overton Square to register and catch the first films of the day. On Friday, the VIP Reception for the On Location Memphis Film and Music Festival was hosted by Charlie Vergos’ Rendezvous in downtown Memphis. The event was open to all filmmakers and music performers in the festival, and featured the Rendezvous’ world-famous ribs and pulled pork, as well as a couple of music performances. The 14th Annual On Location Memphis International Film and Music Festival kicked off last night with an opening reception at the Paradiso theatre in East Memphis, with music provided by Singa Bromfield. After the reception was a 20-minute sneak preview of an upcoming documentary by Martin Shore and Boo Mitchell called The Memphians, which is a film documenting a series of recording sessions in which old-school greats like Otis Clay and Bobby Rush were brough together with rappers like Lil P-Nut, Eightball & MJG and Frayser Boy. This film, along with Dan Greer’s Ole Beale Street Revue which was shown afterwards, brought out many of the living stars of Memphis music, including Boo Mitchell and several other Mitchell family members, the Rev. Darryl Carter, the Rev. Charles Hodges, Bobby Rush, Frayser Boy, Dan Greer, Edward “Hot” Cleveland and Larry Dodson of the Bar-Kays. On Location resumes today at noon at Studio on the Square in Overton Sqaure, and the the first music showcases get underway tonight at Purple Haze at Second and Lt. George W. Lee Avenue. On Location Film and Music Conference Schedule 2013 @OLM_Trailer Opening Night Tonight! It’s time for On Location Memphis Film and Music Conference, one of the four big events occurring in Memphis this weekend. As would be expected, a lot of the films being screened this weekend have a musical theme, including a sneak-peak at The Memphians, a forthcoming documentary about Memphis music, the documentary Ole Beale Street Revue, the moving film I Am Not A Rock Star about concert pianist Marika Bournaki, and Roger Stolle and Jeff Konkel’s amazing blues documentary “We Juke Up In Here.” In addition, there will be live music showcases both Friday and Saturday nights at Purple Haze near Beale Street behind the Westin Hotel. 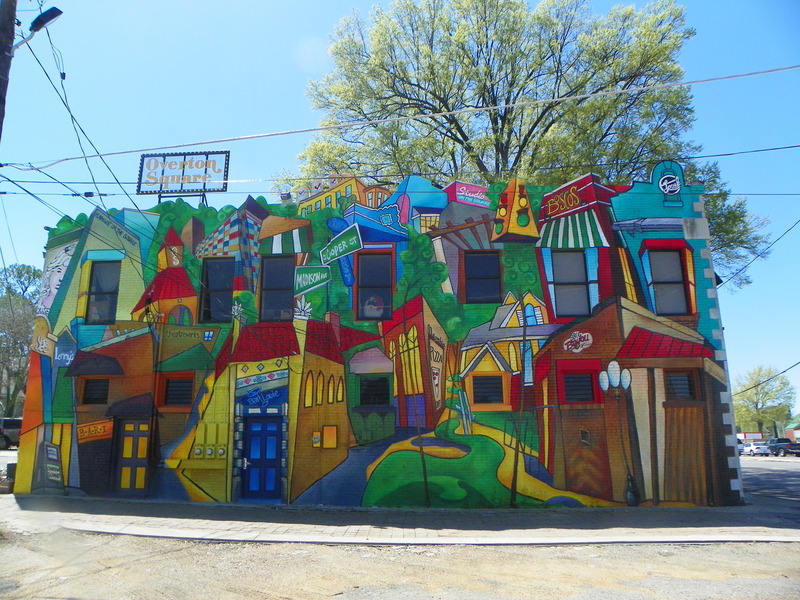 This brightly-colored mural is simply the latest sign that Overton Square is back as a destination in Midtown Memphis. The new Bar Louie location opened last week, directly across from the new location of Local Gastropub. Down the block is Chiwawa, a new and unique Mexican restaurant concept in the old Chicago Pizza Factory location on Madison. 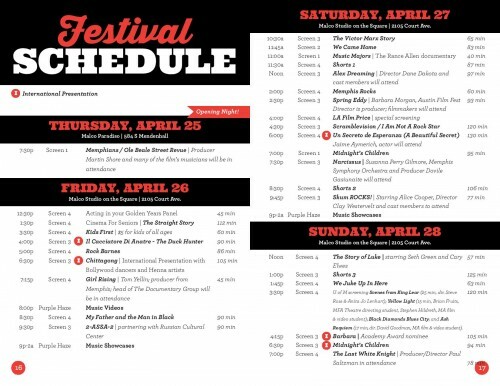 A great time to check out the new offerings at Overton Square is during the On Location Memphis International Film and Music Festival, which largely takes place at the Studio on the Square theatre, April 25-28, 2013. I had volunteered to work with the On Location Memphis International Film and Music Festival, which is being held April 25-28 at a number of locations in the city, so I met with some of the other volunteers Friday evening downtown in the South Main Arts District to hand out postcards about the event outside the Russian Cultural Center during the monthly Trolley Night. Unfortunately, the wet weather kept crowds down to a minimum, not only at our table, but at most of the other events as well.